Chang’e is a lunar deity also known as Heng’e. She is the wife of an archer known as Yi, who once shot down eight suns and left one up, as it caused hardships for people on earth. On doing this, he was awarded an elixir or immortality, but did not consume it straight away. One day, someone broke into his house while Chang’e was there, trying to steal the elixir. Instead of giving it to the thief, she drank it. And found residence in the moon. 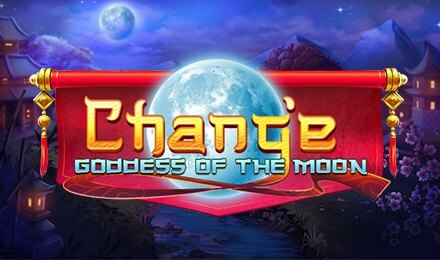 Chang’e – Goddess of the Moon slot is a 5 reel and 20 pay-line slot game powered by Pariplay. On the reels of the slot, find symbols like Yi, Chang’e. white rabbits, lotus flowers, pie, ruan guitars, A, K, Q, J, 9 and 10 landing on your reels. The highest paying symbol is the potion symbol, which awards 50x your stake. On the Bet Field, use the + or – buttons to adjust your stake value. The Auto Bet option also allows you to play the game hands free. Set the number of preferred autospins to put to play. Amount of Paylines Selection: All 20 pay-lines are fixed. Coin Values: Set your bets from £0.02 to £10.00. The wild of the game is Chang’e. She will replace all symbols on the grid bar the scatter symbol. On landing on the slot gird, it will lock in place and will stay there for two to five spins. Combine five wild symbols on a pay-line and receive 50x your stake. Three Symbols : 10 - 20 Spins. Four Symbols : 21 - 40 Spins. Five Symbols : 41 - 50 Spins. When the feature is launched, it is played on a 5 reel and 243 ways to win reel set. Locked wilds come into play during the feature, thus increasing your winning potential.